Mary Robinson Foundation – Climate Justice | How do we wire and inspire people to think and act on climate change? How do we wire and inspire people to think and act on climate change? In a remarkable moment in Paris last December, ministers from 195 countries agreed to stop global warming “well below” 2 degrees Celsius. This agreement was decades in the making, and represents a strong signal to leaders in the private, public, and social sectors. But now that the celebrations are over, how will countries, industries, and citizens close the gaps on emissions to comply? A mix of political will, investment, culture change, and compassion will be necessary to ensure the agreement is actualized and climate justice achieved. 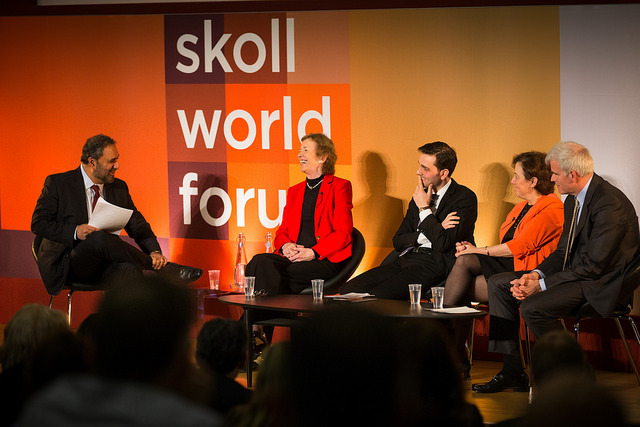 The Skoll World Forum hosted a session Post Paris: A New Era in Global Sustainability? to get to the bottom of these questions on April 14 2016. Dipender Saluja of Capricorn Investment Group, Former President of Ireland Mary Robinson, Thom Woodroofe of Independent Diplomat, Mindy Lubber of Ceres, and David Blood of Generation Investment Management came together to discuss what are the critical tasks that need to happen and who needs to take them. Scale, timing and scope of action was discussed by the panellists in the context of the private and financial sectors. “ We need trillions of dollars a year to build a clean energy economy that will have the ability to change and get us to a 1.5 degree world” said Mindy Lubber. “When we think about making a transition to a more sustainable economy, a sustainable world, we need to go beyond thinking of it just as energy…. It’s mobility, its food, its agriculture, its finance, its consumer products, its technology in every respect.” I don’t think the capital markets recognise the urgency of the problem.” said David Blood. Thom Woodroofe reminded the audience that one of the most important next steps for the Paris Agreement is ratification at national level “There is a really good chance that the Paris Agreement could enter into force next year. All that we require is 55 countries which represent 55% of emissions to ratify the agreement”. Speaking on the actors that need to engage on climate action post-Paris, Mary Robinson said “We need a movement that says that this is too important to be left to politicians and the United Nations”. Watch Post Paris: A New Era for Sustainability?